Here's a heads-up to all modern driving enthusiasts from across the globe who are tracking on the latest development about Google's autonomous cars project. The tech giant has recently announced that its driverless cars are already on the go for road testings. Google, in its Monday blast through AP, has said that their driverless cars have already started to acclimatize the navigation of the city streets, including the challenges that are likely to show up in different areas such as jaywalkers and bicyclists intertwining the highway. Over the past year, Google has seen notable progress but the Silicon Valley tech giant said the cars still have plenty of learning to do before the year 2017 -- the company's target year to formally introduce its autonomous driving technology to the public. A test group of at least ten cars have been fitted out by the project team for this highway check. Among test cars include three Lexus RX450h, six Toyota Prius, and an Audi TT. Each of these cars was accompanied by one of a dozen drivers in the driver's seat and a Google engineer in the passenger seat. One of the test roads navigated by the vehicles was the Lombard Street of San Francisco -- a road known for its steep hairpin turns. They also went over the Golden Gate Bridge and took a tour around Lake Tahoe. Each of the test vehicles employs a system of sensors to maintain distance from other vehicles while the system driving at the speed limit stored on its maps. Google engineers have also entrenched a system override, allowing a human driver to take control of the car by simply stepping on the brake and maneuvering the wheel. The system is closely akin to the cruise control systems present in today's cars. Google's driverless car is a company project that implicates enhancing of technology for autonomous cars. The project is led by the co-inventor of Google Street View and former director of the Stanford Artificial Intelligence Laboratory, and Google engineer Sebastian Thrun. Thrun and his Stanford team were the people behind the successful creation of the robotic vehicle called Stanley, winner of the 2005 DARPA Grand Challenge. These cars are powered by certain software called Google Chauffeur. News on a driverless vehicle from Google called Robo-Taxi first surfaced in August 2013. 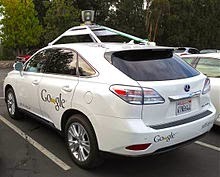 Similar gossips re-appeared early in 2014, after Google acquired a patent for an advertising fee funded transportation service that comprise autonomous vehicles as contemporary transport method.